Modis Image of the Great Salt Lake taken 9 August 2015. Based on historical levels, the Great Salt Lake is going through an especially low period. Is it, however, a record? It turns out this is a surprisingly difficult question to answer. What could be so hard about measuring the elevation of a lake? The Great Salt Lake is a terminal lake (i.e., it has no outlet) and thus the surface elevation and area of the lake fluctuate with variations in inflow and evaporation. The former plays a primary role with long-term wet periods leading to high stands and long-term dry periods leading to low stands. High stands occurred in the 1870s and 1980s, with a record minimum of 4, 191.3 feet in 1963. We are currently in a long-term dry period and the Great Salt Lake levels are relatively low (note that the graph above ends in 2006, so don't use it for the recent past). As shown below, the USGS guage at Saline is presently sitting at only 4191.4 feet, just a shade above the record low. Thus, a record should be imminent right? Not so fast. If we examine the gauge at Saltair, we find that the lake level is sitting at about 4193.3 feet, nearly 2 feet higher than the record low from 1963 (note the shift in range of the y-axis compared to the plot above). How can the lake level vary by almost 2 feet between these two gauges? 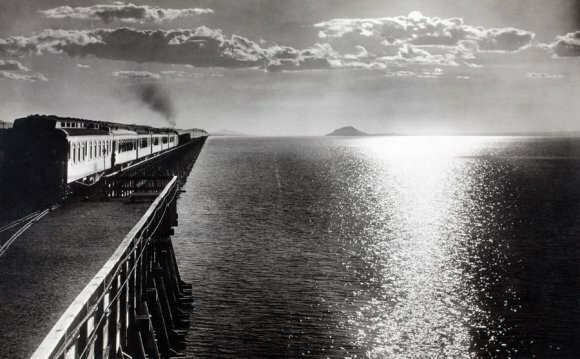 In 1956 the Southern Pacific railroad began construction of a rock-fill causeway across the center of the Great Salt Lake, which was completed in 1959. You can see the location of the causeway in the MODIS image at the top of this post as there is a clear contrast in the color of the two halves of the lake that it separates. Breaches have subsequently been added to the causeway to allow some flow between the two halves, but ultimately the Great Salt Lake remains a lake divided. Much of the freshwater inflow enters the southern half of the Great Salt Lake. As a result, the southern half of the lake is usually higher than the northern half, as is the case at present, leading to a higher reading at Saltair (southern half) compared to Saline (northern half). Now let's talk about the record. It is fairly clear that the historical low stand of the Great Salt Lake occurred in 1963. That was shortly after the completion of the causeway. At that time, measurements were only collected at Saltair in the southern half. Saline wasn't added until 1966. The record of 4191.3 feet was based on a measurement at Saltair. 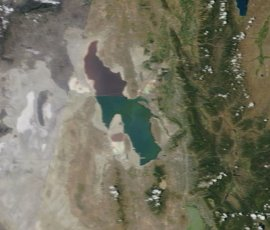 Thus, it appears that water levels in the northern half of the Great Salt Lake may be nearing an all-time low, although we don't have measurements from Saline in 1963 to confirm this. It is possible, given the existence of the causeway that water levels in the north half in 1963 were even lower than they were in the south half. Water levels at Saltair are presently above those measured in 1963, although the current low stand probably qualifies for the 2nd lowest in the historical record. It is possible that there are some manual observations of water levels or photographs that might shed a bit more light on this issue. It would be an interesting project to explore. Too bad we didn't have high-resolution satellite images in 1963! The Great Salt Lake Nationals.